Brad Marchand took Conor McGregor’s passionate pregame speech to heart. 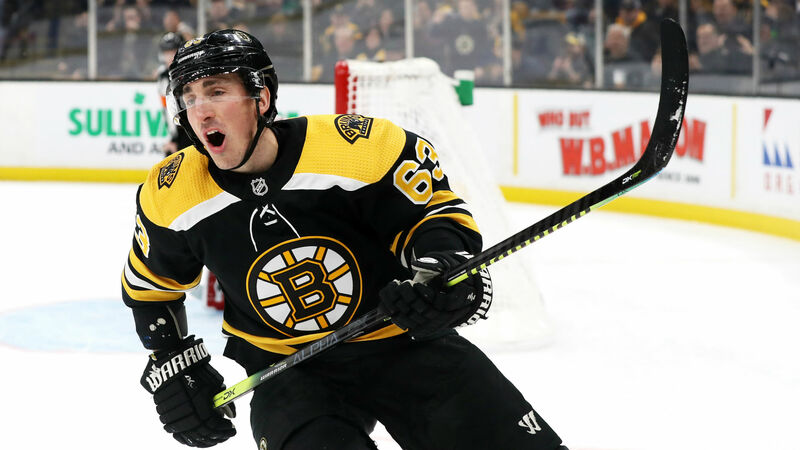 The Bruins winger netted the game-winning goal in overtime to give Boston a 2-1 win over the Columbus Blue Jackets on Saturday night. To celebrate the win, Marchand busted out his best imitation of McGregor’s signature strut. McGregor, who marched in the St. Patrick’s Day parade in Boston earlier in the day, traveled to TD Garden for his first-ever hockey game and dropped the ceremonial puck. “I am undefeated in this building, just like the Bostonians themselves — that’s what I told the team in there,” McGregor said. “That’s what I said when I walked in there. I said, ‘Are you’s ready for war? When I say Boston, you say strong. Boston Strong! Boston Strong!’ They all rose up with that energy. The energy definitely rubbed off on Marchand, who tallied the 15th overtime goal of his career. With two points in the game, he assisted on Patrice Bergeron’s first period goal, Marchand reached 87 points for the season to set a new career-high. Marchand tallied 85 in each of the past two seasons. Before Saturday’s win, the Boston was dealing with a three-game losing streak but the week ended on a notorious note.